Rabiola, Keur/Pref Metall Ferro, Pref. Juno Don Diego ISF is an eye-catching true black 2014 KWPN gelding working nicely under saddle. He has a good character and will be a terrific young horse for an amateur to bring along with a trainer. Juno likes to hack out and is well-mannered to work around. Sire Uno Don Diego (Dressage Royal x Falkland) represented Denmark at the 2009 Six-Year-Old Finals at the World Young Horse Championships in Verden, Germany. Uno competed successfully at the Advanced Level of dressage in Europe and won at Prix St. Georges and Intermediaire I with scores above 73% in the United States. Juno’s dam is the stellar Rabiola, Keur/Pref. (Metall x Zadok). 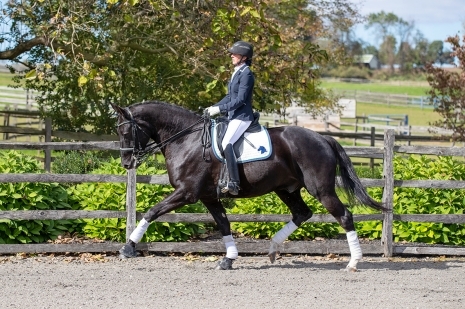 Rabiola was the Grand Champion at Dressage at Devon in 2011, 2010, and 2006, and the Mare Champion at Dressage at Devon in 2010, 2009, 2008, 2007, and 2006. Before being imported, she was the Reserve Champion of the FEI World Breeding Championships in 2001 in Ermelo. Juno is available to be seen by appointment. Please call 610-383-4717 or email sales@ironspringfarm.com for more information today.